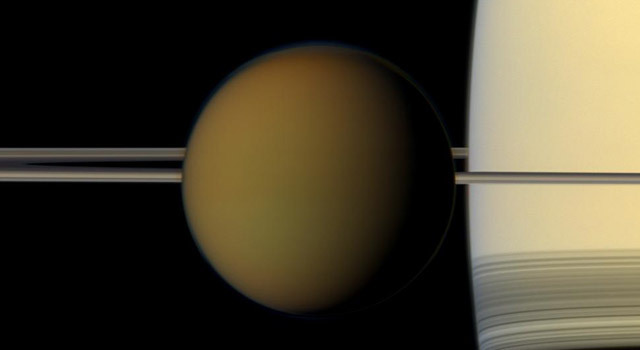 A laboratory experiment at NASA's Jet Propulsion Laboratory, Pasadena, Calif., simulating the atmosphere of Saturn's moon Titan suggests complex organic chemistry that could eventually lead to the building blocks of life extends lower in the atmosphere than previously thought. The results now point out another region on the moon that could brew up prebiotic materials. The paper was published in Nature Communications this week. 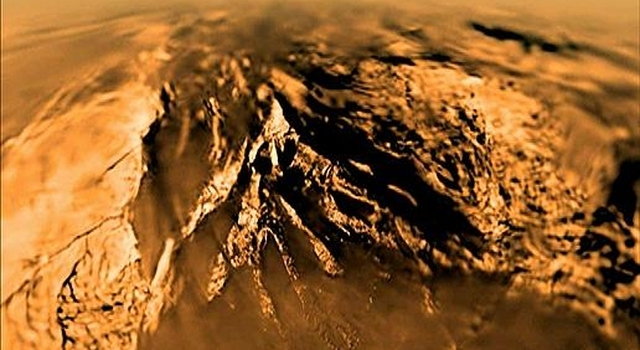 "Scientists previously thought that as we got closer to the surface of Titan, the moon's atmospheric chemistry was basically inert and dull," said Murthy Gudipati, the paper's lead author at JPL. "Our experiment shows that's not true. The same kind of light that drives biological chemistry on Earth's surface could also drive chemistry on Titan, even though Titan receives far less light from the sun and is much colder. Titan is not a sleeping giant in the lower atmosphere, but at least half awake in its chemical activity." Scientists have known since NASA's Voyager mission flew by the Saturn system in the early 1980s that Titan, Saturn's largest moon, has a thick, hazy atmosphere with hydrocarbons, including methane and ethane. These simple organic molecules can develop into smog-like, airborne molecules with carbon-nitrogen-hydrogen bonds, which astronomer Carl Sagan called "tholins." "We've known that Titan's upper atmosphere is hospitable to the formation of complex organic molecules," said co-author Mark Allen, principal investigator of the JPL Titan team that is a part of the NASA Astrobiology Institute, headquartered at Ames Research Center, Moffett Field, Calif. "Now we know that sunlight in the Titan lower atmosphere can kick-start more complex organic chemistry in liquids and solids rather than just in gases." The team examined an ice form of dicyanoacetylene -- a molecule detected on Titan that is related to a compound that turned brown after being exposed to ambient light in Allen's lab 40 years ago. In this latest experiment, dicyanoacetylene was exposed to laser light at wavelengths as long as 355 nanometers. Light of that wavelength can filter down to Titan's lower atmosphere at a modest intensity, somewhat like the amount of light that comes through protective glasses when Earthlings view a solar eclipse, Gudipati said. 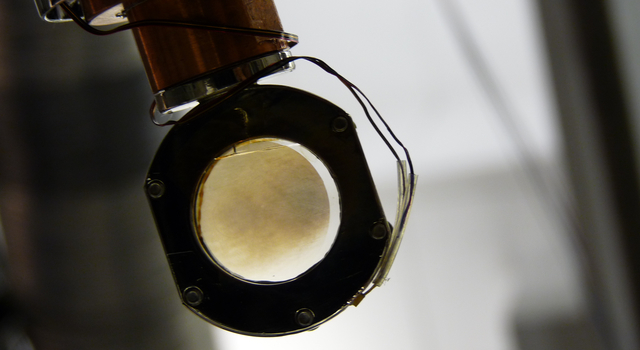 The result was the formation of a brownish haze between the two panes of glass containing the experiment, confirming that organic-ice photochemistry at conditions like Titan's lower atmosphere could produce tholins. The complex organics could coat the "rocks" of water ice at Titan's surface and they could possibly seep through the crust, to a liquid water layer under Titan's surface. In previous laboratory experiments, tholins like these were exposed to liquid water over time and developed into biologically significant molecules, such as amino acids and the nucleotide bases that form RNA. 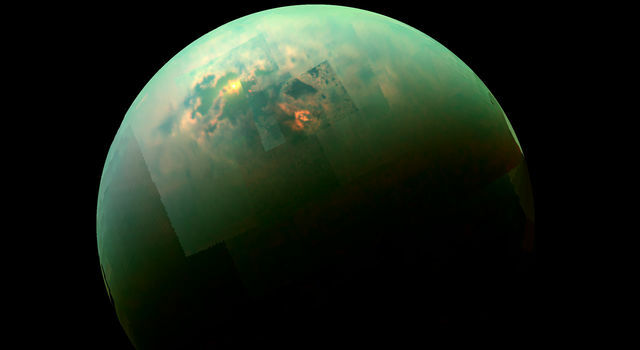 "These results suggest that the volume of Titan's atmosphere involved in the production of more complex organic chemicals is much larger than previously believed," said Edward Goolish, acting director of NASA's Astrobiology Institute. "This new information makes Titan an even more interesting environment for astrobiological study." The team included Isabelle Couturier of the University of Provence, Marseille, France; Ronen Jacovi, a NASA postdoctoral fellow from Israel; and Antti Lignell, a Finnish Academy of Science postdoctoral fellow from Helsinki at JPL. Founded in 1998, the NASA Astrobiology Institute is a partnership between NASA, 15 U.S. teams and 13 international consortia. 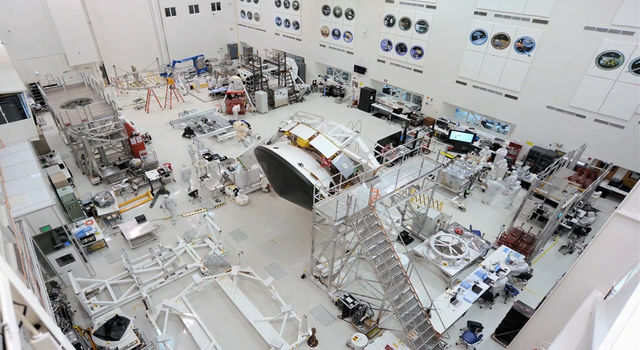 It is based at NASA Ames Research Center, Moffett Field, Calif. 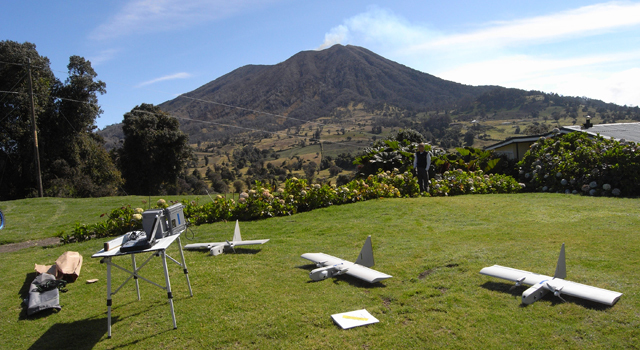 The Institute's goals are to promote, conduct and lead interdisciplinary astrobiology research, train a new generation of astrobiology researchers, and share the excitement of astrobiology with learners of all ages. The NAI is part of NASA's Astrobiology program, which supports research into the origin, evolution, distribution and future of life on Earth and the potential for life elsewhere. For more information, visit http://astrobiology.nasa.gov/. JPL is a division of the California Institute of Technology, Pasadena.